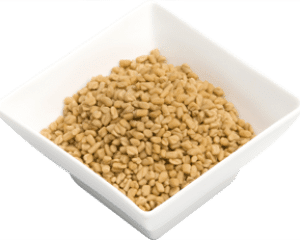 Fenugreek seeds are the ripe fruit obtained from the small fenugreek plant and are a member of the legume family. The small hard seeds have a yellowish caramel colour and a bitter sweet and nutty flavour with a pungent aroma. The seeds, when dry, are very hard and difficult to grind. However, if you soak the seeds in water overnight or cook the seeds in water the seeds disslove into a soft paste. Their subtle bitter taste lends them for use most extensively in Indian curries but also in savoury sauces and vegetable dishes in Mediterranean cuisine.